When Marvel pooled its superhero talent for 2012's The Avengers, the rationale was obvious: If Iron Man or Thor or the Incredible Hulk could top the box office solo, just think how massive a summer blockbuster with all of them would be. And although the result was indeed a mega-hit—it's the all-time third-biggest film worldwide—the gamble was that afterward, we'd still happily plunk down our money for future movies starring just one of the gang. But as with the post-breakup Beatles, not all the Avengers are huge solo draws: Everybody lined up for Iron Man 3, but a Hawkeye movie would be the equivalent of Ringo's Sentimental Journey. Going into Captain America: The Winter Soldier, I wasn't sure I really needed another movie devoted to the guy. 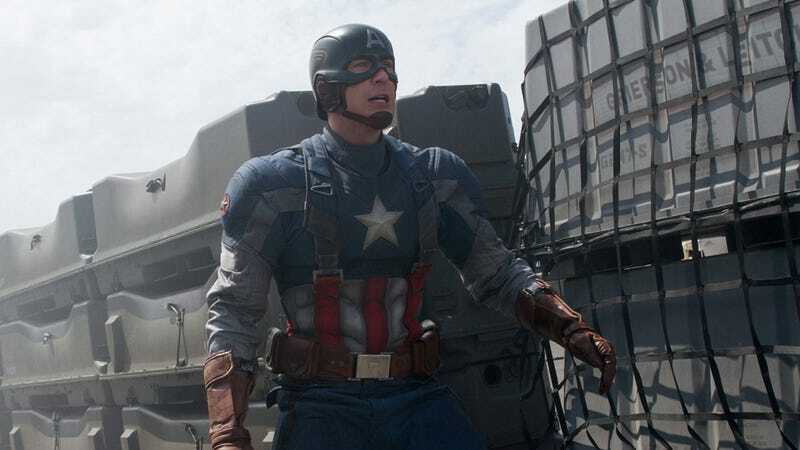 He's a perfectly fine superhero, but in comparison to Iron Man or the underrated Thor films, 2011's Captain America: The First Avenger was serviceable without being very memorable. Chris Evans had the right amount of chiseled authority for the part, but he was stuck in a fairly square action-adventure storyline—and in The Avengers, he was far less interesting than Iron Man or Hulk. If the Avengers were the Rolling Stones, Cap seemed destined to be the Ron Wood of the unit: an incredibly likable dude, but not the one you looked to for the indelible moment. I've changed my mind. A smart, sleek, muscular thriller, this sequel finally gives Steve Rogers his due and, perhaps more importantly from Marvel's perspective, gives viewers plenty of reason to be excited for the next installment in his story. The guy will never be as cool as Tony Stark, but The Winter Soldier goes down a slightly darker path than most Marvel movies, without sacrificing the S.H.I.E.L.D. franchise's big-grin vibe. It's pop with a little soul underneath. That setup powers The Winter Soldier's James Bond-like plot, pitting Captain America and his crew against a mysterious squad of elite assassins, including a masked man with a metal arm who's known only as the Winter Soldier: Practically indestructible in the same way that Cap is, he's the Zod to our hero's Superman. There's a lot of story to juggle here—not to mention the fact that Captain America is still coming to terms with the fact that everyone he knew and loved from the 1940s is long since dead—but it's deftly handled by directors Anthony and Joe Russo, previously best known for their work on sitcoms (Arrested Development, Community, Happy Endings) and 2006's You, Me and Dupree. Considering that background, it's interesting that The Winter Soldier is at its worst when it's trying to be funny. (This is one of those movies where characters lamely wisecrack during big action scenes.) But the plot-twists—and there are a couple nifty ones—and the action sequences are expertly executed: Nothing here is jaw-droppingly amazing, but it's all delivered with such efficiency that the result zips along with propulsive confidence. The movie gets plenty of juice from the mystery of the Winter Soldier's identity—the reveal is linked to Cap's past—but the Russos also seem to enjoy upending some of our expectations for a Marvel movie. For once, the almighty S.H.I.E.L.D. isn't so helpful, and unlike, say, Iron Man 3, the hero isn't saddled with an annoying/adorable kid sidekick. Johansson's casually flirty Black Widow is far better company. But in its own modest way, this is also something of a mini-Avengers, co-starring not just Black Widow, but also Cobie Smulders' S.H.I.E.L.D. agent Maria Hill and Anthony Mackie as a war veteran with his own secret. Think of this as an over-performing solo album with a great backing band. Much like Superman, Captain America is a little too perfect and a little too virtuous, with an origin story far less compelling than Batman's. The Winter Soldier gets around that problem by placing him in a riveting action-thriller with a surprisingly emotional core. In these Marvel films, Cap always struck me as a bit of an all-business drip: He gets the job done, but with little panache. This movie honors that stripped-down, no-nonsense commitment to doing the job right, but not at the expense of a good time.